Scaffolding – Don’t Forget Your Tools!! Scaffold Spanner – A box or tube type wrench with a swing over handle that has been purpose designed for the tightening and releasing of couplers. Magnetic Spirit Level – A spirit level is used to sure the footings of the scaffold. The job of levelling the scaffold is made easier when the spirit level is magnetic. These are available at most harware stores. 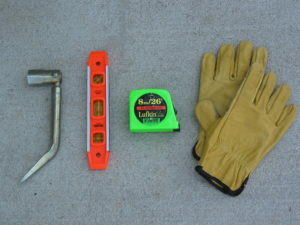 Tape Measure – The tape measure is used to check distances and square scaffold components relative to each other. 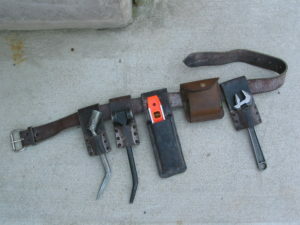 Scaffolder’s Belt – The scaffolder’s belt includes provisions for all scaffold equipment as well as other tools. The belt is worn around the waist and provides a safe and efficient means of carrying tools.